Taco Bell, the food chain that brought you the Dori-Taco and other inedible stuff, charmed millions -me included- with a hilarious TV spot that broke during last night’s Super Bowl. Created by Deutsch, Viva Young features a group of ‘viejitos’ having a wild night: Getting tattooed, making out in bars, breaking into other people’s swimming pools and driving around recklessly… all this to the tune of a heavy-accented Spanish-language version of Fun’s We Are Young. This entry was posted in Food, Television and tagged Doritos Tacos, Super Bowl, Taco Bell. Bookmark the permalink. 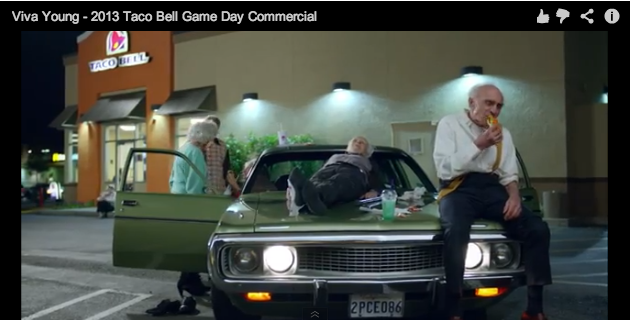 The spot also made it clear why Taco Bell’s food is textureless mush — dentures.